Personalized Bar or Bat Mitzvah Art :: "Yerushalayim"
This B'nai Mitzvah art is aptly called "Yerushalayim". 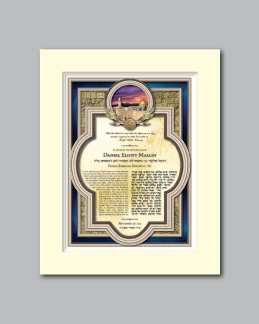 The outermost portion of the design depicts a field of blue, symbolizing our connection to the divine Creator, Hashem. Overlaying the field of blue and separated by a silver border are the sacred stones of the Western Wall. At the top of the design, within the circular silver window, is the spiritual center of the Jewish people; the city of Jerusalem. Within the text area of the design, above the name of the B'nai Mitzvah, is the following inspirational quote by Ralph Waldo Emerson, "What lies behind us and what lies before us are tiny matters compared to what lies within us". 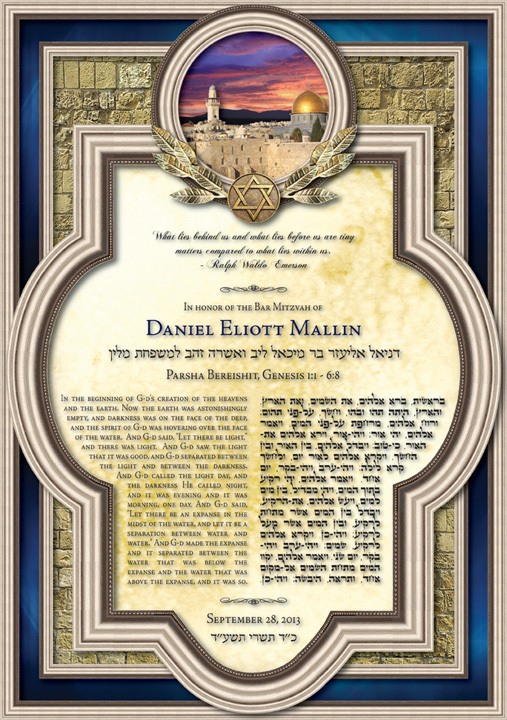 These words, along with the imagery of of Jerusalem, are meant to inspire the Bar or Bat Mitzvah boy or girl to remember their spiritual connection with Gd and to understand that who they are and who they become as responsible adults will shape the course of their lives.